One year ago today, the world lost a special man that I never had the privilege of meeting. Yet this man left a huge impact on the world after his death. On April 2, 2009, Hank Wise walked into Johnny's Sports Bar in Nashville, Tenn. He had stalked Nikki Goeser as she and her husband Ben Goeser ran their karaoke business at various clubs throughout the area. Wise had tormented Nikki for months and had often been told to leave her alone. Yet that fateful night one year ago today left Ben Goeser gunned down by this jealous beast. But the purpose of this story is not to dwell on this tragedy, but to talk about the positive results that have come from this horrible event. I am a firm believer that things happen for a reason, and you hold onto this "thing" and you grow from this "thing" and you become the best person you can and you make sure you live everyday like it is your last day. Perhaps Ben never knew that his loving wife Nikki would rise up from the ashes of this horrible event and become a strong crusader for Second Amendment Rights. Maybe he never knew that in his death, he would become a martyr for innocent victims so they would be able to defend themselves in no-gun zones. Perhaps he never knew that he would become famous after his death. But, I'd bet he knew that his loving wife had the strength to turn this fateful night into the positive actions that she has! Nikki Goeser has embraced the death of her Ben, and has made it a mission to use it to help each state that will have her, educate its legislature on the Second Amendment. Ohioans have now had the privilege of Nikki testifying before the House and Senate committees hearing "restaurant carry" legislation. She didn't need to make the trip to Ohio TWICE for our benefit. But she did! 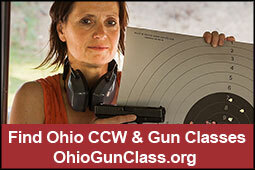 Ask yourself: has this feisty Tennessee woman done more for gun rights in Ohio than you have? I didn't know Ben Goeser, but I sure wish I had gotten the opportunity to meet him. I can only know him through the pictures that now are left behind, but I can tell that Ben was the fun-loving, kind, gentle man that Nikki has told me about. As we go through life, we all will have some sort of tragedy hit one of our loved ones. I know - it has happened to my loved ones as well. You can either let it eat you alive or you can do as Nikki and I have done, and put that tragedy to work for the betterment of yourself and mankind. We could have blamed the gun! But it was NOT the gun that took our loved ones. It was the beast behind the gun. I question in my mind why people such as Toby Hoover or Sarah Brady cannot see it. Nikki Goeser commented "My husband Ben taught me that no matter what happens in your life, you can either choose to stay down or you can rise above. I choose to take the love he shared with me and turn it into something positive. It was because he loved me with everything he had that I keep going and fighting for what is right. No one should go through what Ben and I have been through. Ben will always have my heart no matter where life takes me. He was a wonderful man." The leadership team and supporters of Buckeye Firearms Association send out our heartfelt condolences and prayers to the Goeser family as they remember their Ben on the first anniversary of his passing. Ben, you sent a gift from heaven to all of us. Her name is Nikki! And we thank you for that, Ben. Linda Walker is Central Ohio Chair of Buckeye Firearms Association, is the recipient of the NRA's 2009 "Sybil Ludington Women's Freedom Award," owns On The Defense, LLC and instructs concealed carry classes regularly.